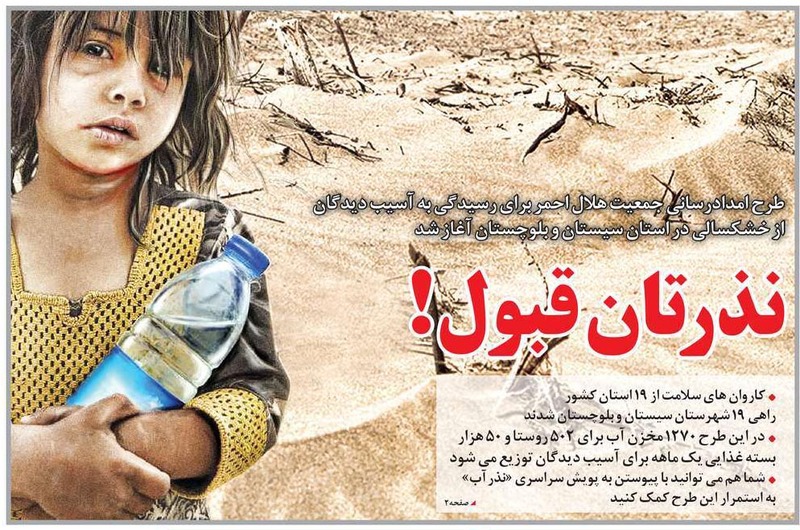 TEHRAN - The precipitation rate in Iran has dropped by 27 percent over the past eleven months (September 23, 2017 to August 21, 2018), compared to its long-term average, head of the national center for drought and crisis management, affiliated to the meteorological center, has said. "The country with 158 millimeters of rainfall over the aforementioned period, is still 27 percent below the long-term average level of 228 millimeters," ISNA quoted Sadeq Ziaeian as saying. Referring to the provinces with the highest and lowest rainfall during the last eleven months, he noted that provinces of West Azarbaijan and East Azarbaijan have received the highest precipitation rates by 25 and 21 percent increase in rainfall compared to the long-term mean. "At the same time, Kordestan, Kermanshah, Ardebil, Hamedan, Zanjan, Qazvin, Semnan and Ilam provinces met normal average," Ziaeian stated. 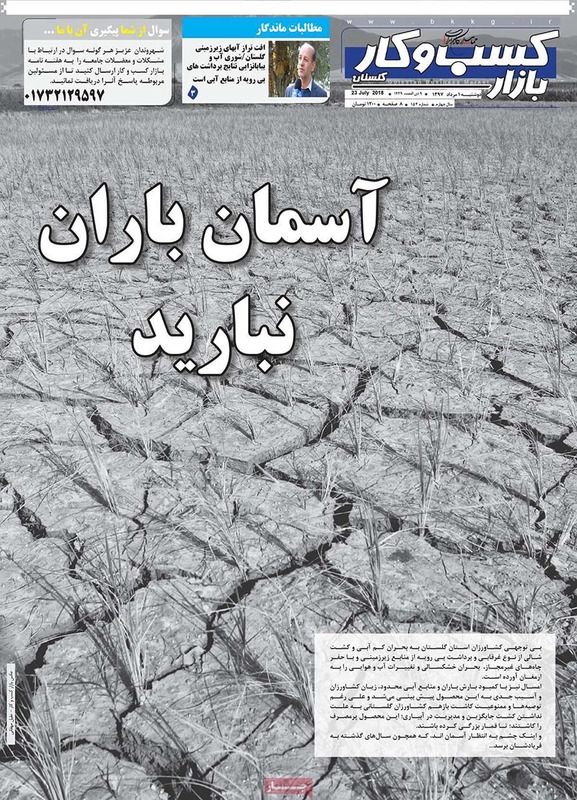 He regretted that Sistan-Baluchestan province has been suffering serious rainfall shortages with 74 percent drop, adding, provinces of Hormozgan and Kerman both experiencing 66 percent of below-average rainfall, and Fars province lacking precipitation by 56 percent, have been listed among the cities having the lowest precipitation rates. "Over the same period, Tehran averaging just 205 millimeters of precipitation, faced 53 millimeters drop compared to its long-term average of 258 millimeters," he noted. So, the capital experienced a decrease by 21 percent in comparison to its long-term mean and this amount reaches to 31 percent when comparing to the same period last year, he also regretted. Ziaeian went on to say that the country contained a monthly average precipitation rate of 1.5 millimeter over the second month of summer (July 23-August 22) which, compared to the 3.4 millimeter reported last year, has seen a 61 percent decrease. Moreover, the provinces of Gilan and Mazandaran precipitation has reached average rates of 43.4 and 32.8 mm, respectively, while precipitation in the province of Gilan despite of receiving normal average rainfalls, faces a lack of 47 mm compared to its long-term average, he further explained. "Mazandaran province has experienced greater increase in precipitation than others by 26 millimeters," he added. Golestan province got some 4.8 mm of rain, while its long-term average rainfall rate is reported to be 21 mm, so the province with 16 mm short of rainfall hit the record high for the lowest precipitation rate nationwide, over the month of Mordad (July 23-August 22), he lamented. "Iran has experienced an average 1.3 degrees on the Celsius scale temperature rise during the past 11 months (September 23, 2017 to August 21, 2018) compared to its long-term mean," Ziaeian highlighted. Over the 11 past months all Iranian provinces have faced an increase in temperature, he lamented. Provinces of West Azarbaijan, Zanjan, Kordestan, Qazvin and East Azarbaijan experienced the highest temperature rise, he added. He also stated that compared to the long-term mean, Tehran also had 1.5°C increase in temperature over the aforementioned period. The country has faced a temperature rise of 1.2°C since last month, in comparison to the long-term mean of the same month, Ziaeian noted. He went on to say that last month, Markazi and Zanjan provinces with 2.1 °C temperature rise, saw the biggest variations in mean temperatures. "Compared to the average temperature reported last year in month of Mordad, the capital has faced a temperature rise of 1.9°C this month," he concluded.